Nell Breyer and Jeff Warmouth both have large-scale media art illuminating the Boston Convention & Exhibition Center LED marquee. Laura Chasman, Andrea Sherrill Evans, and Helena Wurzel exhibit Portraits at Drive-By in Watertown (3/1-4/7). Read about it on ArtSake. High praise for Claire Beckett‘s Simulating Iraq at the Wadsworth Atheneum from Boston Globe critic Sebastian Smee. A public reading of Steven Bogart‘s new play The Last Sky Writer in the Universe is at Southern New Hampshire University (3/16, 7 PM), where Steve is artist-in-residence. Congrats to Jessica Bozek, whose Small Animal Project Reading Series won a grant from the Cambridge Arts Council. Read about Timothy Coleman woodworking mastery on NECN.com. Candice Smith Corby was among the top 100 finalists for the Artists Wanted Year in Review! Patrick Donnelly reads from his new book at Smith College (3/13, 7:30 PM). Joshua Fineberg recently completed a new solo piece to be played by pianist Marilyn Nonken for Joshua’s upcoming CD of complete piano works. Tanya Larkin publishes her first book of poetry, My Scarlet Ways, which won the 2011 Saturnalia Poetry Prize. Scott Listfield is in group shows Thinkspace Gallery in LA (3/3-3/24) and a new gallery in Austin. Investigate further via modern social media technology. Mary Bucci McCoy: Manifest is at Kingston Gallery (thru 4/1). Andrew Mowbray currently has work on the cover and in an 8-page article in Sculpture Magazine! Flux-Boston takes an admiring look at Caleb Neelon on the occasion of his show Victory Garden at Endicott College (thru 3/16; talk/reception on 3/6). Matthew Rich is showing in Volta NY (3/8-11), has a solo show at Samson Projects (3/23-4/28), and is in To the Venetians II at RISD Painting Dept. Gallery (thru 4/18). Elizabeth Whyte Schulze is in Surface Design: Textile as Painting/Painting as Textile at Mobilia Gallery (thru 4/28). Peter Snoad‘s new full-length play Raising David Walker has a staged reading at the Baltimore Playwrights Festival (3/10). Joe Wardwell‘s Big Disgrace, a solo show of recent work, is at LaMontagne Gallery (3/3-4/11). Read Joe’s nano-interview. Maxine Yalovitz-Blankenship presented her Nine Houses Boxed Folio at the Radcliffe Institute for Advanced Study in February and is exhibiting two paintings – shown with poems inspired by the paintings – at Boston Athenaeum (3/7-4/2). 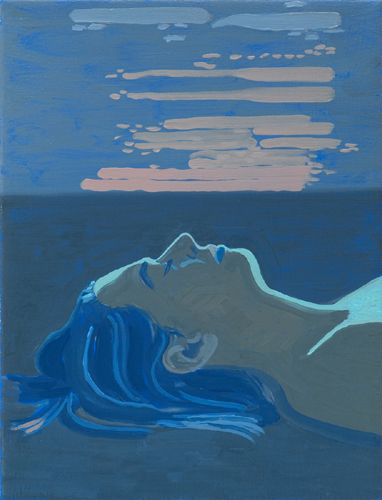 Image: Helena Wurzel, UNDERCURRENT (2011), Oil on canvas, 16×12 in. Along with Portraits at Drive-By (see above), Helena has a dual show (with Ariel Freiberg) at Laconia Gallery called One Is Always Forgotten (3/2-4/22).